A widowed German housecleaner (Brigitte Mira) falls in love with a much-younger Moroccan mechanic (El Hedi ben Salem), but the couple’s May-December, cross-cultural romance must withstand constant scrutiny and prejudice from their neighbors, friends, and family. Peary writes that “for those who consider the films of Rainer Werner Fassbinder too esoteric and perverse, here is one that has universal appeal”; in fact, “it was Fassbinder’s breakthrough film internationally, the reason many people worldwide were willing to examine his more difficult, less accessible films.” He writes that “the couple is strong enough to endure” the “constant racial prejudice [Salem] and other Arabs in Germany are subjected to, but in time Mira’s own prejudices surface and threaten to shatter the marriage”. 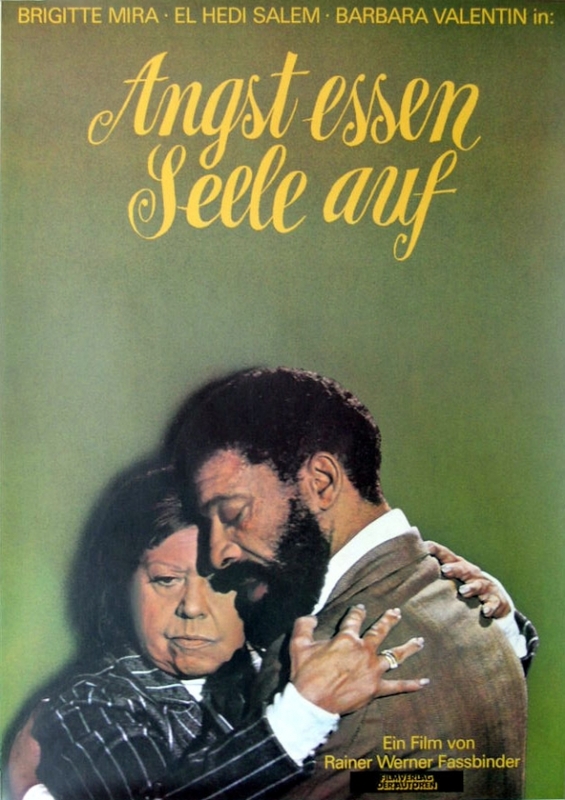 He concludes his review by noting that this remains “a simple, extremely poignant film, all the more fascinating because Fassbinder deals with racial prejudice in modern Germany — against Arabs, not Jews.” Indeed, Mira and Salem’s unique cross-cultural romance remains as touching and relevant as ever — perhaps even more so in the early 21st century, as Europe’s demographics continue to shift contentiously. Mira is perfectly cast in the central female role, and fans will definitely want to check out the 2003 interview with her on Criterion’s digital restoration DVD. Salem’s personal story (he was Fassbinder’s lover in real life) mirrors his onscreen tragedy, albeit on an even more catastrophic scale; I’d love to find a copy of the 2012 documentary about him entitled My Name is Not Ali, but haven’t had any luck so far. Suffice it to say that this films reminds us how being an “outsider” — whether older, darker-skinner, less-attractive, foreign, lower-class, gay — remains an ongoing challenge for many (if not most) humans across the globe. Ali: Fear Eats the Soul is simultaneously a balm for one’s heart (“When we’re together, we must be nice to each other — otherwise, life’s not worth living.”) and a cautionary tale that our souls are hardly free from the xenophobic fear “Ali” warns us of. Note: Peary writes that “Fassbinder admired the work of Douglas Sirk, and critics were quick to point out the film’s similarity to Sirk’s All That Heaven Allows,” as well as themes from Sirk’s Imitation of Life. Yes, as a foreign classic. Yes, indeed …with the rise in xenophobia in the United States (bizarre as that is), it was certainly refreshing to revisit this remarkable film. ~it’s also shown how people (‘friends’, relatives) can ‘forgive’ when they need something from someone they otherwise disapprove of (i.e., Mira’s son needs a babysitter; her neighbor needs some of Mira’s cellar space). How weird when people think you don’t realize it when you’re being used. The film is especially poignant when it focuses on conflicting emotions inside its protagonists. There are wonderful shots of both Mira and Salem when they are completely without words in the face of sudden confusion. Thank God (!) Fassbinder allows his lovers a relatively happy ending. Those who know the filmmaker’s work rather well know that this is perhaps the gentlest of all of his films. The bulk of his work runs rampant with angst – as if most of the other films had not learned just how much fear actually does eat the soul. Side Note: It is so tragic that Salem took his own life (in prison) three years later – and that Fassbinder did not even learn that until just before his own death in 1982. If only the two could have known more of the peace that this film represents. If not Fassbinder’s best, it certainly has to be up there (though my personal favorite is Lola). I’m still slowly treading through his catalog, as I find him to be a fascinating character but the quality of his work is wildly inconsistent, particularly in the run up to Ali. He treats the subject of their relationship in a touching, personal and refreshingly non-sensational way. At heart, they are two thoroughly isolated and lonely people in their respective walks of life who find a genuine companion while surrounded by a seemingly endless array of repellently shallow, bigoted and unsympathetic people. This all takes place in Fassbinder’s characteristically worn-out, dull and cramped spaces in a still-banged-up West Germany. Work breaks are on a bare stairwell, meals at her tiny kitchen table, big family gatherings in tiny apartments, etc. Fassbinder movies tend to center around alienation, and tentative, often tragically unreliable relationships. His work seems to be the most emotionally wrought of the New German Cinema directors, based on what I’ve seen so far. But to David’s point, Fassbinder allows for a satisfying if not happy ending here, unlike anything I’ve seen from Fassbinder’s early stuff. That alone must have been a welcome prospect back then. Peary makes the point that Ali was Fassbinder’s breakthrough. After slogging through his full length directorial debut Love is Colder than Death and attempts at watching a couple others pre-Ali, I concluded that the subject matters aren’t holding them back as much as the movies are just too slow. Some to the point of being an exercise in endurance, some are almost unwatchable. Too many drawn out shots and scenes. Ali finds a better equilibrium in the pacing department. And it has a more delicate, contemplative element to it, and it feels natural and appropriate, and its essence pulls you in. It probably was the first movie of Fassbinder’s that some critics and audiences were able to actually get through… But the hits started coming after Ali, for sure, and Ali showed what heights Fassbinder was capable of. My Name is Not Ali (2011) is an extra on the UK Blu-ray of Fear Eats the Soul from Arrow. Ah, good to know — thanks, Rick! I watched it streaming on Filmstruck. It’s a great disc; Arrow are among the best in the business for this kind of thing, better and more meticulous in their transfers and especially in the encoding than Criterion. Criterion have been going though a slack period over the last five years or so with poor encoding. However, you will need to be multiregion capable for BD. It would also be necessary for you to have a TV that can play 1080/50i (European standard) as well as 1080/60i (US standard). Unfortunately, most North American equipment can only handle 1080/60i material and extras on Euro discs can be 1080/50i. However, Arrow have tried to make their material 1080/60i – especially with their discs for both UK and USA. This one may not be so formatted because Criterion have the US rights. I mean, it may be so formatted as 1080/50i being locked to the UK region only.